The New Moon of Monday, September 29, is an important one to many people of the world. In the Hebrew Calendar, it marks Rosh Hashanah (literally, ‘head of the year’) which is the beginning of year 5769. On Tuesday night, September 30, Muslims across the world will see the first slender crescent of this lunar cycle. That will mark the end of Ramadan and the beginning of the next month, Shawwal. 1 Shawwal is ‘Eid ul Fitr, one of the greatest holidays in the Islamic calendar. This week, then, is a good time to think about the Moon, why it’s here, how it orbits, and how we have used it to measure time. Unlike our months, Hebrew and Islamic months begin with the New Moon. Because twelve lunar months add to only 354 days, less than the 365.25 day solar year, an extra month is occasionally needed to keep the months roughly aligned with the seasons. In a 19 year cycle, years 3, 6, 8, 11, 14, 17, and 19 have the extra month. The year that is ending, 5678, is number 11 in its cycle and was a leap year. Interestingly, the Jewish year has two ‘beginnings’. Tishrei (the month which begins now) is the first month of the civil calendar, and the month where 5678 becomes 5679. However, it is actually the seventh month of the religious calendar, which begins at Nisan (the month of Passover). The Islamic calendar functions slightly differently. Its months begin with the first visible crescent low in the west at dusk, which is not with the actual New Moon. Keep in mind that at New Moon, the Moon is in line with the Earth and Sun, and the entire near side of the Moon has nighttime (and is therefore dark). The New Moon is visible, therefore, only if it blocks the Sun during an eclipse. Since this New Moon occurs early Monday morning, the 29th, we expect it to be visible by Tuesday evening, the 30th. Observant Muslims, then, will continue to fast in daylight hours Monday and Tuesday. Upon seeing the Moon Tuesday night, they will know that Ramadan has become Shawwal, and they may break their fast on Wednesday. Due to early controversy as to which years would have it, Muhammad outlawed the 13th month that kept Islamic months tied to the seasons. As a result, Ramadan (and each other month in that calendar) begins 11 days earlier each year according to our Gregorian calendar. The Moon is Earth’s only natural satellite, orbiting our planet once every 27.3 days. However, a cycle of moon phases (say, from New Moon to the next New Moon), takes 29.54 days. This is because the Earth itself is moving during each 27.3 day Moon orbit. Since it is much easier to observe the Moon’s changing phase cycle than to observe the Sun directly, the 29.54 day phase cycle was the basis of many ancient calendars. 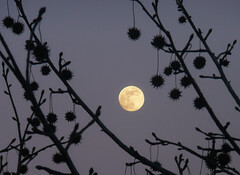 Words for ‘moon’ and ‘month’ are related in English and are identical in many other languages. There is some evidence that our word ‘moon’ is ultimately related to an Indo-European word for ‘measure.’ Given how long we’ve measured time by the Moon, it is easy to take its presence for granted. However, our Moon is quite remarkable in several ways. Moons in our solar system are generally much smaller than the planet they orbit. 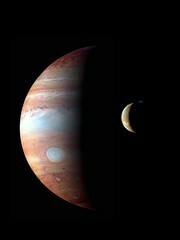 Jupiter and Saturn, for example, are about 25 times bigger across than their biggest moons. Earth, though, is only 3.67 times the diameter of our Moon. Also, moons usually orbit in the same plane as their planet’s equator. Our Moon, though, orbits within about 5 degrees of Earth’s orbital plane, called the ecliptic, which is not the plane of the equator since Earth is tilted 23.5 degrees on its axis. This leads most astronomers to believe that the Moon did not form with the Earth, but is the result of a collision with with an object roughly the size of Mars. According to this theory, the impactor (sometimes called ‘Theia’) struck a glancing blow on the Earth and was completely destroyed, and the Moon formed from the debris of Theia’s and Earth’s mantles. This impact is what left Earth with a Moon much larger than what a planet Earth’s size would normally have, and left that Moon near Earth’s orbital plane (where the impact occured). Our relatively big moon has crucial effects not only on our tides, but also on the stability of Earth’s tilt. Earth’s orbital tilt of about 23 and a half degrees as it goes around the Sun causes the seasons. The axis precesses, describing an aparent circle roughly every 26,000 years, but the amount of tilt (obliquity) stays nearly the same. 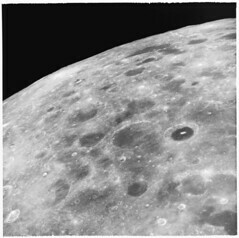 Because the Moon acts a counterweight, the obliquity varies only between 22.1 degrees and 24.5 degrees over about 41,00 years (we are now at 23.44 degrees and decreasing). Even this orderly variation, called the Milankovitch cycle, is enough to influence our Ice Ages. Imagine the impact on Earth’s climate if there were no Moon, and the obliquity varied chaotically. This is exactly what happens at Mars, where the tiny moons Phobos and Deimos are not massive enough to influence Mars’ tilt. One thing our Moon does have in common with most others is that it orbits the Earth and rotates on its own axis at the same rate. This is called ‘synchronous rotation’ and it occurs because the Moon is not exactly uniform in composition. From the time the Moon formed, the slightly heavier side was attracted to the Earth. Over time, this effect de-spun the Moon until it attained synchronous rotation. The Moon’s gravitational attraction also de-spins the Earth, although much more slowly as the Moon is less massive. As it does so, the Moon moves slightly farther from the Earth (just over 3 cm per year). The Moon is now 1.5 meters farther away that it was when Apollo astronauts went there. Don’t worry, though, by the time the Moon is far enough away to escape, the Sun will have become a red giant and swallowed both Earth and Moon anyway. What is the shape of the Moon’s trajectory around the Sun? Perhaps not what you’d expect. So, I encourage every one to watch for the reappearance of the Moon in the evening sky this week, even if you aren’t celebrating a New Year or an ‘Eid. The Earth’s companion gives all of us something to appreciate. Previous Post Draw Dinos Right!